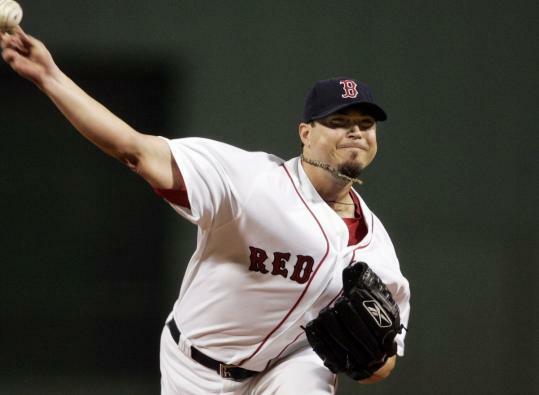 When Josh Beckett was scratched from his last start, slowed by back spasms, the memories of last season’s end crept in. It was then that the pitcher, fashioned as one of the all-time best postseason pitchers, endured a rough end. Three poor postseason starts lasted a total of 14 1/3 innings and featured an 8.79 ERA. The injury crippled the Sox, turning a team that could have overturned the Rays into one left watching the World Series. And, now, Beckett appeared to be hurting again. But he received three cortisone injections after the back spasms began, a minor procedure that got him back on the mound last night for his final tune-up before the Sox head to California for the American League Division Series. And although it might not have started exactly as he had planned, the most important result of the Red Sox’ 11-6 win over the Indians last night was that Beckett emerged healthy, emerged unscathed, emerged ready to head the Sox’ postseason rotation, no matter which game he gets to start. Health does not appear to be an issue anymore. So Beckett, despite the four runs allowed in five innings, is now set to ready himself for his next start, in the second game of the first round of the playoffs, taking a spot behind Jon Lester. Francona’s life was made easier last night, at least as of the third inning. Because after Beckett started out slowly, brushing off rust, allowing too many hits to the Indians, he became playoff-ready Beckett in innings three through five. His heart rate sank, his mind slowed, and he was able to pitch the way he must pitch to be successful in the postseason. He had too much energy entering the game, spent too much time trying to throw 120 miles per hour, as he said. By the time pitching coach John Farrell headed out to the mound in the second inning, the bases were loaded for Travis Hafner, with the Sox down, 3-1, and just one out in the inning. Although the Indians’ clean-up hitter got a run in on a fielder’s choice, it would be the final run allowed by Beckett. He got through the third, fourth, and fifth innings, giving up just one single and one walk, looking far more like himself. At that point, the Sox had a cushion after scoring seven runs in the second, including the first grand slam of Victor Martinez’s career. And Beckett, as Martinez said, went from overthrowing and missing to settling in, hitting his spots, and becoming effective. “I thought he looked like he hadn’t pitched in a while and I think that’s expected,’’ Francona said. “Then he got in the rhythm of the game, got some good two-seam movement, started getting his breaking ball. They hit some fastballs early. But the way he finished over the last three, I thought it was really productive. I think he probably feels pretty good about himself, as he should. He was done by the end of the fifth, yielding the mound to Paul Byrd. His line was not exactly as he might have wished, with those four runs scored on seven hits and three walks and five strikeouts on 98 pitches. Those, after all, are not the numbers that Beckett is accustomed to putting up, especially down the stretch. Then again, it was a meaningless game pitched for the purpose of getting the Sox closer to the end, and preparing for the playoffs. But, at the same time, it was a crucial game for Beckett, to get back in the flow, to see where he was, to make sure he remained healthy, all before he and the Sox get to the most important part of their year. Sox-related multimedia from around the web.